For other uses, see Double Star (disambiguation). 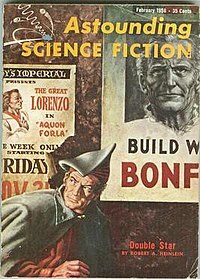 Double Star is a science fiction novel by American writer Robert A. Heinlein, first serialized in Astounding Science Fiction (February, March, April 1956) and published in hardcover the same year. It received the 1956 Hugo Award for Best Novel (his first). The story, which is told in the first person, centers on down-and-out actor Lawrence Smith (stage name Lorenzo Smythe, also known as "The Great Lorenzo"). A brilliant actor and mimic, he is down to his last coin when a spaceman hires him to double for an unspecified public figure. It is only when he is on his way to Mars that he finds out he will have to impersonate one of the most prominent politicians in the Solar System (and one with whose views Smith deeply disagrees): John Joseph Bonforte. Bonforte is the leader of the Expansionist coalition, currently out of office but with a good chance of changing that at the next general election. Bonforte has been kidnapped by his political opponents, and his aides want Smith to impersonate Bonforte while they try to find him. Bonforte is rescued, but he is in poor health due to the treatment inflicted on him during his imprisonment. This forces Smith to extend his performance, even to becoming temporary Supreme Minister and running in an election. (This is made plausible through Bonforte's extensive Farley files.) The central political issue in the election is the granting of the vote to Martians in the human-dominated Solar System. Lorenzo shares the anti-Martian prejudice prevalent among large parts of Earth's population, but he is called upon to assume the persona of the most prominent advocate for Martian enfranchisement. Smith takes on not only Bonforte's appearance, but some aspects of his personality. At the moment of electoral victory, Bonforte dies of the aftereffects of his kidnapping, and Smith assumes the role for life. In a retrospective conclusion set twenty-five years later, Smith reveals that he wrote the first-person narrative as therapy. Lorenzo has become Bonforte, suppressing his own identity permanently. He has been generally successful and has carried forward Bonforte's ideals to the best of his ability. Penny (Bonforte's adoring secretary and now Smith's wife) says, "she never loved anyone else." Galaxy reviewer Floyd C. Gale praised the novel, finding it "an excellent example of Heinlein's ability to take one of the oldest plots in any literature ... and present it as an enjoyable reading experience." Admitting "a certain reservation, even disappointment," Anthony Boucher nevertheless concluded that Heinlein was "simply creating an agreeably entertaining light novel, and in that task he succeeds admirably." At the 1957 Worldcon it received the Hugo Award for Best Novel (his first) of the previous year. In 2012, the novel was selected for inclusion in the Library of America two-volume boxed set American Science Fiction: Nine Classic Novels of the 1950s, edited by Gary K. Wolfe. The political system depicted in the book is a constitutional monarchy, with the House of Orange elevated to the role of providing an Emperor of the Solar System, while the Monarchs of other dynasties became courtiers at the Imperial court. The Emperor reigns (but does not rule) from a palace on the Moon, with the real power in the hands of a Supreme Minister, who must command the support of the Grand Assembly. Elections for the Assembly are held as in a Parliamentary system — there is an upper time limit (five years) between elections, but they can be called more frequently if the Prime Minister so decides, or if he is forced to it by the loss of a vote of confidence. The United States is mentioned as initially having an unspecified associate status, and later obtaining full membership. In the system, the U.S. maintains full internal autonomy and is obviously a powerful voice in Empire affairs; Bonforte himself is an American. The legislative power rests with a Grand Assembly, which also meets on the Moon (where the Imperial bureaucracy is located), most members representing an area of Earth or another planet, with other members representing constituencies not tied to any geographic place; one represents space pilots, for instance, and another districtless university women. As in the British system, representatives need not live in their district or be an actual member of the non-geographical constituency. Candidates for safe seats are determined by the central party office. At the time depicted in the novel, Venusians may vote in elections for representatives - their vote determined mainly by subtle philosophical differences incomprehensible to humans - while Martians do not have the vote, and extraterrestrials of any kind are not permitted to be members of the Assembly. Bonforte has pledged himself to remove this exclusion. An afterword makes clear that he eventually does so, though his party subsequently loses power. The names of the two contending main parties - the Humanity Party and the Expansionist Party - were evidently chosen by Heinlein to make readers avoid jumping to hasty conclusions. At first glance, judging from the names, the Humanity Party could be expected to be the more progressive of the two. In fact, however, The Humanity Party is the party of human supremacists while the Expansionist Party favors expanding rights to include other intelligent species. The cover illustration for a 1970s UK edition of Double Star (artist: Anthony Roberts) was the subject of an unlikely controversy when it was used as the basis of an entry for the 2000 Turner Prize for modern art. The artist in question, Glenn Brown, was accused of plagiarism. ^ James Blish, The Issues at Hand, pp. 53-54. ^ "Recommended Reading," F&SF, June 1956, p.101. ^ "1956 Award Winners & Nominees". Worlds Without End. Retrieved 2009-07-26. ^ Dave Itzkoff (July 13, 2012). "Classic Sci-Fi Novels Get Futuristic Enhancements from Library of America". Arts Beat: The Culture at Large. The New York Times. Retrieved January 9, 2013. ^ "Copycat row hits Turner Prize". BBC. 2000-11-28. Retrieved 2007-11-26.